You can create an analysis model incrementally, using the toolbox functions for each step in the workflow. 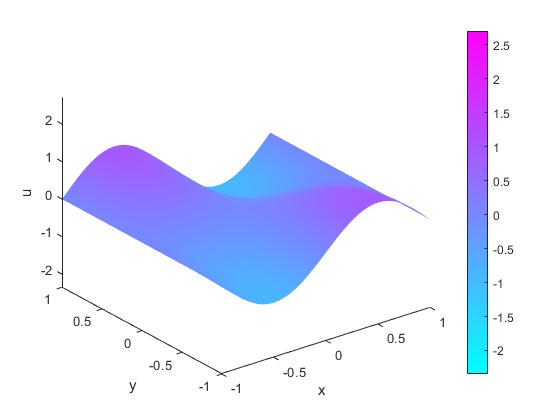 You can create the model at the command line or you can represent it in MATLAB® code, allowing the parameters of the model to be altered manually or automatically by a script. To represent your equation or system as a PDE model, follow the steps described in Solve Problems Using PDEModel Objects. This approach supports both 2-D and 3-D analysis problems and provides complementary functions for solving and results visualization. For 2-D geometry problems, you also can use the PDE Modeler app. The app includes geometry creation and preset modes for applications. You can choose to export data to the MATLAB workspace from any step in the app and continue your work outside the app. Solve the wave equation using the solvepde function. 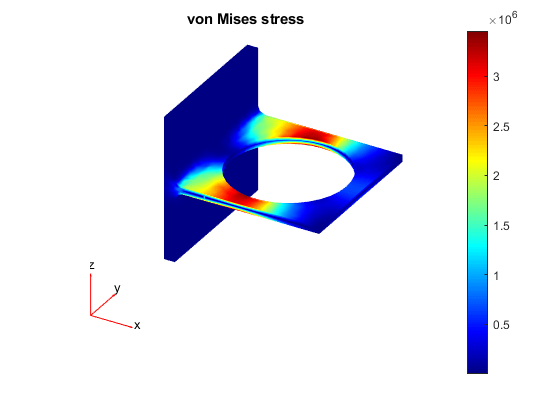 Analyze a 3-D mechanical part under an applied load using finite element analysis (FEA) and determine the maximal deflection. Solve the heat equation with a temperature-dependent thermal conductivity. The example shows an idealized thermal analysis of a rectangular block with a rectangular cavity in the center.